In a repeat of the last editionai??i? ?s final, defending champions India will take on Afghanistan in the 2013 SAFF Cup title decider, at the Dashrath Rangasala on Wednesday. After a brilliant 1-0 victory over a strong Maldives side, the Blue Tigers will step into the final in confident mood, and will hope to get the better of the Lions of Khorasan for the second consecutive time in as many years. It has been quite a bumpy ride for India at the ongoing SAFF Championship in Kathmandu. After a lucky 1-0 win over Pakistan in their opening game, India were fortunate to escape with a point in the following game against Bangladesh. In the final group game, the blue tigers succumbed to a 2-1 defeat to hosts Nepal. Despite being locked with Pakistan on points India however, managed to progress into the semis, courtesy of a better head-to-head record against the Shahins. After a series of abysmal performances in the group stages, the blue tigers seem to be peaking at the right time. A gritty win over Maldives in the semi-final has given the fans renewed hope of seeing the country lift its 7th SAFF title. After following a strategy of nullifying the threat of Maldivian forward Ali Ashfaq, Arnab Mondalai??i? ?s late winner against the Red Snappers sealed Indiaai??i? ?s place in the final of the tournament, despite under-performing throughout the group stages. The Wim Koevermans coached team now faces the task of overcoming the Afghans, whom they conquered in New Delhi two years ago. This time around, the Lions of Khorasan have a much more matured side than in 2011, and will definitely pose a much greater threat. Subrata Paul has played a crucial role for India throughout the tournament, with stellar performances against Pakistan and Maldives. The custodian will have major role to play in the final too, with the Afghans set to field a strong forward line. The central defence pairing of Gouramangi and Arnab Mondal has had a decent tournament so far, and will be key to Indiaai??i? ?s chances in the final. The full-back positions are set to be occupied by Nirmal Chettri and Syed Rahim Nabi. 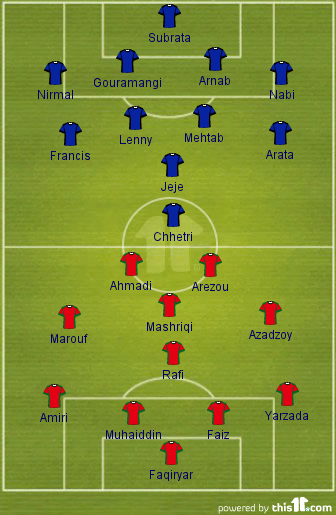 Chettri will face the task of containing the strong Afghan left flank of Amiri and Marouf, and the ability of right winger Francis Fernandes to track back will be crucial in such a situation. Fernandes himself has had a few good outings throughout the campaign, and will hope to do well against Amiri and Co. The midfield duo of Lenny Rodrigues and Mehtab Hossain will, however, have the biggest roles to play for India, against a strong Afghan midfield. Mehtab has so far been one of Indiaai??i? ?s best players in the tournament, and his performance on Wednesday will be crucial to the teamai??i? ?s chances. Lenny, on the other hand, has had a topsy-turvy campaign, and has played well in patches. If the Blue Tigers are to defend their title, Lenny will have to step up his game by a notch, and combine well with Mehtab. The left-wing has been Indiaai??i? ?s Achilles heel throughout this tournament, with none of the make-shift left flankers having much effect in that position. Jeje has had little success playing there, while Arata Izumi hasnai??i? ?t done anything much either. With Jeje possibly starting as a striker to complement the returning Sunil Chhetri up front, Arata is set to start on the left, in case he recovers from the knock he picked up against Maldives. India have scored 4 goals in 4 matches so far, and against an in-form Afghan defence, will have to do better than in the previous games if the blue tigers hope to win the title. Jeje and Sunil Chhetri will most likely lead the Indian attack. The last few years have seen Afghan football undergo a tremendous rise. The highest point came in 2011 when the national team reached the SAFF Cup final, albeit they eventually lost the game to India. This time, the Lions of Khorasan have a chance to go one step better by winning the trophy. Revenge, as captain Amiri mentioned in a pre-game press conference, will be in the minds of the Afghan players when they step out against India for the final. The Afghan side of 2013 can be said to be a huge improvement over the Afghan side of 2011, with many youngsters maturing into much better players during the last couple of years. 27-year old Mansoor Faqiryar was in inspired form in the semi-final against Nepal, making a late penalty save to deny the hosts an equalizer. His performance earned him praise from the countryai??i? ?s president Hamid Karzai. Faqiryar will be an important asset to the Afghans, and it will definitely take something special from the Indians to get past him. The inspirational Zohib Islam Amiri will lead the Afghans from the back, and will be as important going ahead as he will be at the back. His marauding runs through the left flank can cause a few headaches to the Indian defence. The Afghan backline will be completed by Mujtaba Faiz, Ali Yarzada and Farzad Muhaiddin, with Farzad most likely set to return from injury for the final. The Afghans have quite a few options in midfield, but Mohammad Rafi and Bhawanipore midfielder Mohammad Mashriqi look like definite starters, with youngsters Azadzoy and Marouf probably getting the nod to start on the wings. The Afghan attack will be led by Belal Arezou and Sandjar Ahmadi. Both these strikers have been vital in Afghanistanai??i? ?s recent rise, and will give the Indian back-line some serious trouble. For India to win, it will be extremely important to give as less space to this duo as possible. The East Bengal midfielder has been one of Indiaai??i? ?s best players so far in the tournament, and will be important to Indiaai??i? ?s chances in the final too. The Afghans have a formidable midfield, and the performances of Lenny and Mehtab can go some way in deciding which way the tie swings. For 21-year old Sandjar Ahmadi, the final against India will be one of the biggest games of his life. 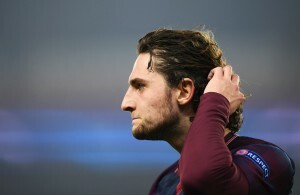 The youngster has been in fine form recently, and his partnership with Belal Arezou up front will be important to the countryai??i? ?s chances of lifting the title. There is little to differentiate between India and Afghanistan in terms of technical ability. Despite Indiaai??i? ?s win over Maldives, the Blue Tigers havenai??i? ?t done well in the tournament so far. The Afghans, on the other hand, have been quite brilliant this year, losing only one of their nine internationals, while winning six of them. With the Afghans having an extra dayai??i? ?s rest ahead of the final, and India particularly not in good form offensively, TheHardTackle predicts a narrow 2-1 victory for the Lions of Khorasan, possibly in extra-time.